Our range of Waterproof (IP65) LED Modules have been developed for commercial applications where failure, and poor performance are unacceptable. Our range of Waterproof (IP65) LED Modules have been developed for commercial applications where failure, and poor performance are unnaceptable. 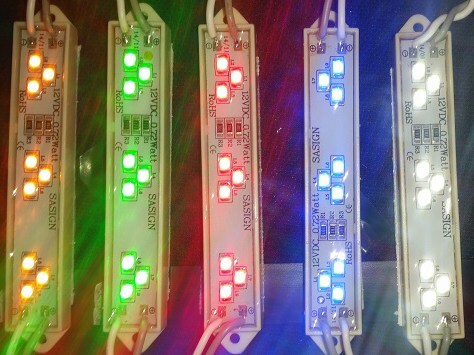 With 4 configurations using between 3 and 9 chips per module, 5 colours and RGB they are manufactured to the highest standards. They are the ideal choice for Channel letters and smaller light boxs. They are not the cheapest, (but then you only buy what you need) and we believe they are the best quality product on the market. We opted for more lower output chips with bigger solder pads, for lower temperatures and bigger solder connections. Our name is on the module- We are so confident.